IAMBRIGITTE : Make your skin happy with Happy Skin! Make your skin happy with Happy Skin! Another reason why I envy those of you who are now in the Philippines, except for being with your family and friends, is because Happy Skin is now available there! By now, I am sure you've heard or read, or even tried the amazing products from Happy Skin. 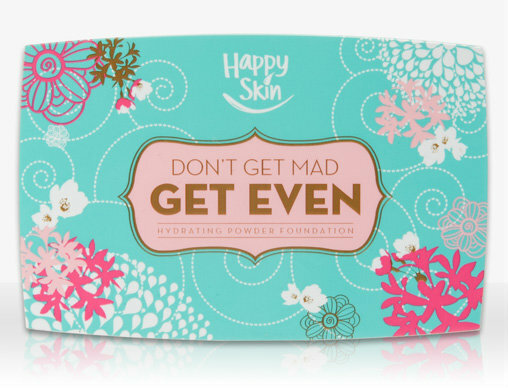 Happy Skin is the newest brand of cosmetics that doesn't only enhance your natural beauty but also takes care of your skin with its special skincare ingredients, such as Japanese tea leaf, cherry blossom, hyaluronic acid and Argan Oil, to name a few. Women nowadays are so much concerned with their skin and scared that using makeup may just harm or aggravate their skin condition. Happy Skin takes care of your skin, your ally in making your skin happy and therefore looking healthier and more beautiful. The complete range is small, having only a few shades for their powder and liquid foundation, tinted moisturizer (called the SS or second skin cream), blushes, lipsticks and under eye concealer. Jacqe Yuengtian-Gutierrez and Rissa Mananquil-Trillo are the beauties and brains behind the brand. Jacqe used to work under a global brand handling personal care products and Rissa is one of the top models and an in-demand host in the Philippines. Both ladies knew the importance of makeup in enhancing one's natural beauty without compromising the skin condition. They were hands-on right from the start, even tested the samples on themselves, to make sure that each product will make the women, and their skin happy! If you'll notice, Jacqe is a mestiza while Rissa is a morena. This only means that both skintones are catered to by Happy Skin! They may have limited shades for now but for sure, the brand will come up with more shades...and more products soon! The best revenge? Looking your best. 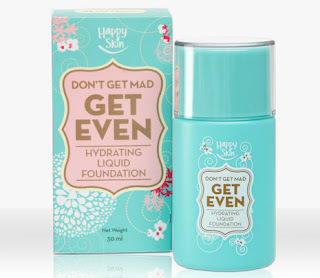 Don't Get Mad, Get Even Hydrating Liquid Foundation knows no bitterness, bad blood, or blemishes. Instead, you get to channel unflustered poise and perfection with your absolutely even complexion. This silky formula glides on naturally and diminishes the appearance of fine lines, discoloration, and wrinkles, making you enviably smooth and supple. The best revenge? Looking your best. 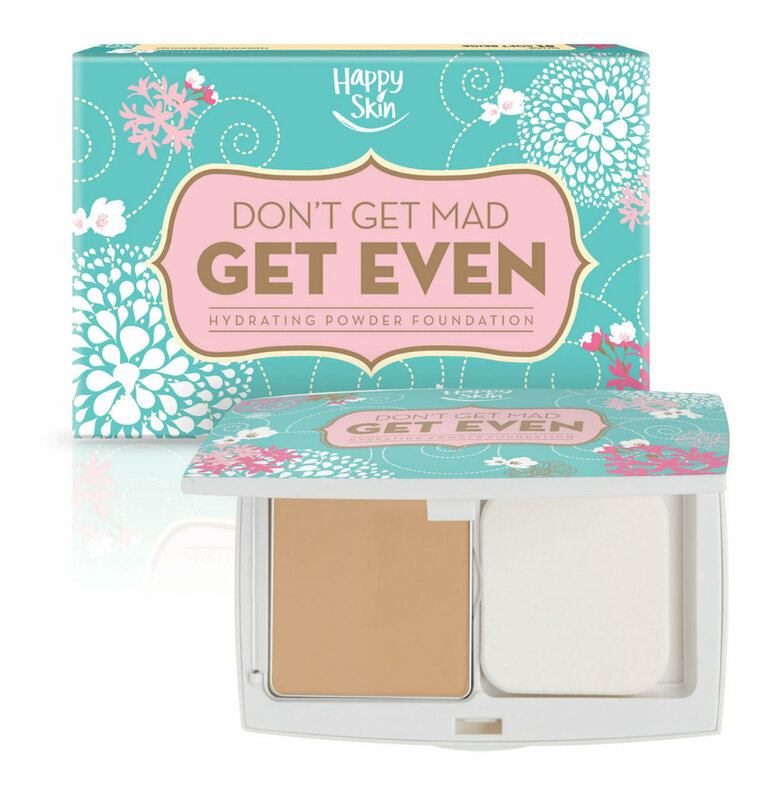 Don't Get Mad, Get Even Hydrating Powder Foundation knows no bitterness, bad blood, or blemishes. Pat on perfection with a hydrating powder foundation that sits flawless on the skin. It layers on beautifully for customizable coverage that minimizes the appearance of pores, fine lines, and dullness. Plus, it provides a stunning, soft-focus finish that hides traces of haggard, sleepless evenings or a heartbreak. Mimic the flush of first love or that fresh, rosy glow brought on by a stolen glance. Happy Skin Get Cheeky With Me Blush lends a hydrating tinge of natural color to your cheeks, topping them with a light-diffusing sheen that lasts all day. Fake that flush of a First Kiss or Summer Fling, shades that bring back that oh-so-loving feeling. Whether torrid or tame, your lips will say it all! This Happy Skin Shut Up and Kiss Me Moisturizing Lippie is sure to help you make that smackin' statement. This lip-loving moisture stick is loaded with Shea Butter and Collagen to get fans to line up for a taste of those supple, hydrated, and ultra-kissable lips. High-pigmented, and moisture-packed, this lippie glides on irresistibly smooth (without the stickiness!) and leaves behind a rich, creamy pout that's way tempting to kiss. I am definitely collecting these! But how!? 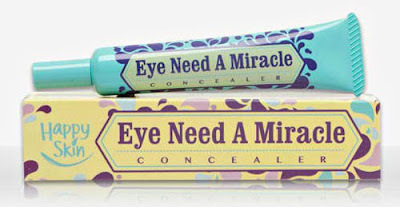 Say goodbye to the telling signs of sleepless nights or party-pooped peepers with Happy Skin Eye Need A Miracle Concealer. 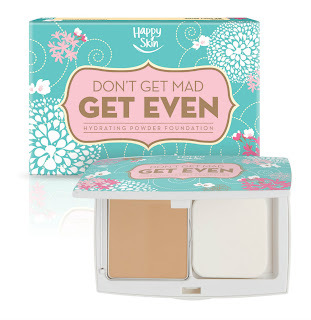 This hydrating, cover-up concealer has a rich, buildable formula the miraculously melts into the skin. It hides those pesky dark circles, redness and discoloration, and fills in those fine lines for a fresh, radiant, I'm-not-haggard-at-all look. And guess what, they have a makeup brush set too! 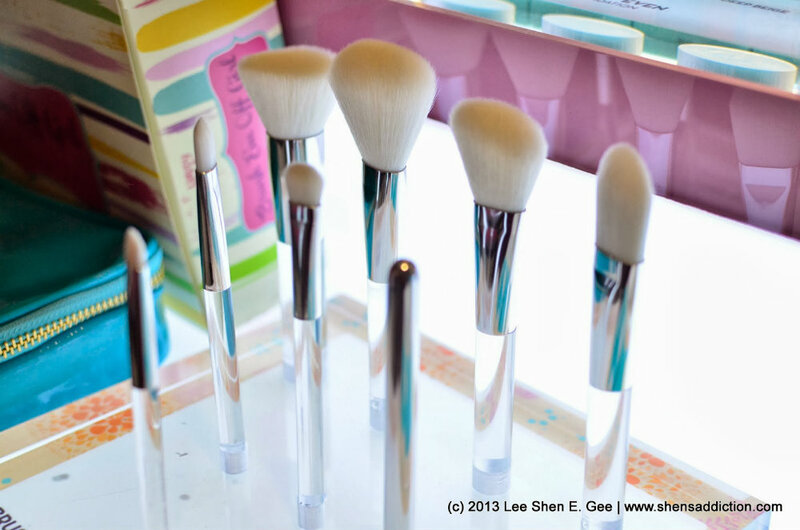 Brush bad vibes away with this makeup brush set! The Happy Skin Brush ‘Em Off Girl includes eight petal soft brushes that help sweep away those frowns, while the crystal clear acrylic handles give clarity to your thoughts making each boo-hoo moment feel like a brand new day. Aside from the witty product names, the packaging are adorable too! These babies are definitely eye-catching and collection-worthy! The prices may be a bit higher than drugstore and local brands available but hey, they are infused with skin-caring ingredients and are made in Japan. I was able to check out some of the samples before and I can say they are comparable to high-end brands. 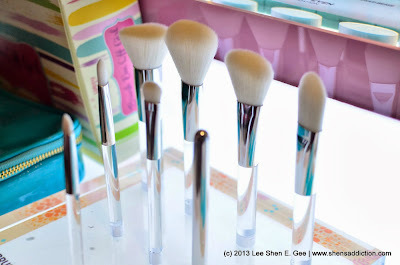 The powders are finely-milled, reminds me of Shiseido's and the lippies are like Clinique's chubby sticks. Sorry for the comparison but that's just my opinion. And I'm sure that those who have tried would say the same. I so cannot wait to get my hands on these. Hopefully they'll have an online store soon that delivers internationally...hahaha, nope, I am not being demanding. I'm just dying of envy of those who are now enjoying these babies. Happy Skin is now available at Plains & Prints stores in Alabang Town Center, Glorietta, Megamall, Shangri-la and Trinoma. Watch out as they will be available soon at other beauty stores and Plains & Prints boutiques. To know more about the brand, check out and like their Facebook page, and follow them on Instagram and Twitter.